Searching for a home within the Metrowest Elementary School Zone? Then you are in the right place! We work hard to make your next home search easy and efficient, so that when you are ready to buy or sell, we are ready to help! 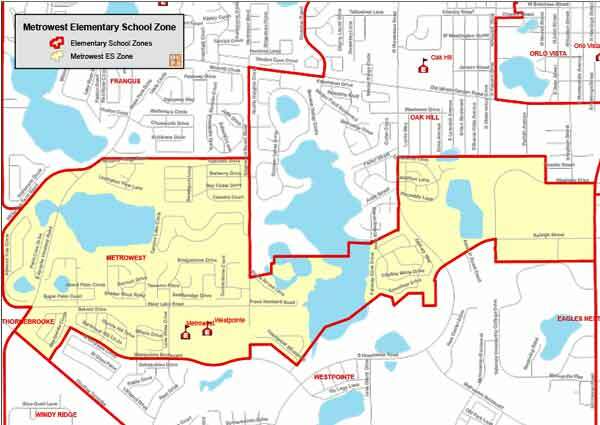 Metrowest Elementary School History and Information: Established in 1988, MetroWest is a master planned development in southwest Orlando. The school’s student population, drawn from surrounding neighborhoods, is culturally and economically diverse. Due to continuing residential growth, MetroWest Elementary was expanded in 1999 to include a Primary Learning Center that housed pre-kindergarten through second grades. Third through fifth grades were still located at the original part of the campus, now called the Intermediate Learning Center. In 2008 MetroWest broke ground on a renovation/rebuild project that eliminated all portables and modular from the campus and added two permanent freestanding classroom buildings, an additional administration suite, revamped and updated the PLC classrooms, converted the old ILC administration building into lab classrooms, provided a chiller system to condition the air for the new buildings, and enhanced the media center, art and music rooms on the ILC side of the campus. As the focus of the local community, MetroWest Elementary enjoys excellent partnerships with parents, community members and local businesses. The PTA provides generous personal and financial support to the school and its activities. The School Advisory Council provides input and support to the faculty and administration, regarding school and community issues. The thousands of volunteer hours donated annually by parents, staff and community representatives are a significant factor in the many national, state and local awards MetroWest Elementary continues to receive. The MetroWest Elementary School faculty and staff strive to meet the developmental needs of each of our 1500 students in a nurturing atmosphere wherein children have the opportunity to feel valued and experience successes. This approach contributes to students developing into confident decision-makers and responsible citizens. The staff’s commitment to educational excellence is evident in their participation in continuing professional education, offered through universities and district/school in-service. Recognition of that commitment, and of the efforts of our teachers, students, families, and community members, comes in the form of an “A” grade which the State has awarded to MetroWest in each of the last 8 years.